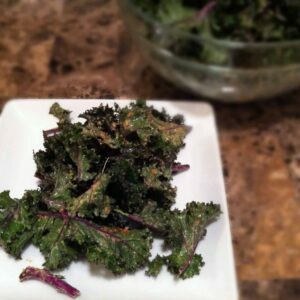 These next few posts are going to be about one of my favorite super foods, Kale. These green gem has been getting more popular lately, and I can’t get enough. In season now, Kale is a great source of flavanoids (powerful form of antioxidants), vitamin K, vitamin C, vitamin A, and fiber. 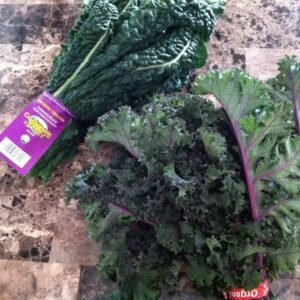 There are several types of Kale, but the below two are the most common. Dinosaur/Tuscan/Lacinatokale is the flatter leaf on the left. Curly kale, the easiest to find I think, is on the right. I like the curly type in raw salads. 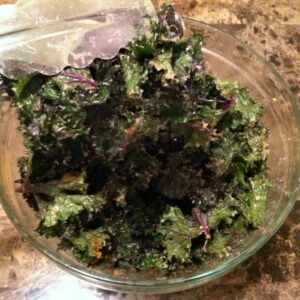 This recipe is going to highlight raw kale as a salad. My friend Anya showed me this dish and I have been making it ever since. Nutty, light and simple, this salad is awesome. In a blender, combine all of the ingredients except kale. Blend until smooth. Tear the kale with your hands into bite size pieces. Add the dressing to the kale and massage until dressing is covered over all the kale. 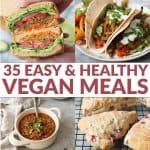 Looking for more Kale recipes? I love kale! One of my favorite ways to have it is just with some lemon juice, small drizzle of olive oil, and olives, red bell peppers. 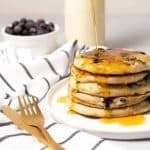 I LOVE it1 Great recipe! I want to go check out the ceasar one!